The Classic is the only MPPT charge controller that has Arc Fault Detection, making this controller the safest controller available. 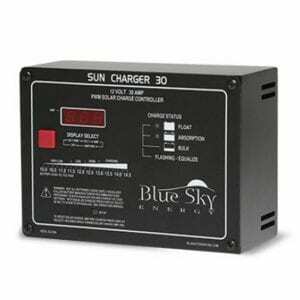 The Midnite Solar Classic lines of MPPT charge controllers will substantially increase the flexibility, features and range currently found on MPPT controllers. The MidNite Classic charge controller is unique in its ability to be used for a great variety of DC input sources. The Classic is designed to regulate DC input from PV, and Approved Hydro and Wind turbines. The Classic 150, 200 and 250 are designed to work with 12, 24, 36, 48, 60 and 72 volt battery banks. With the Classic 150 ranging up to 96 amps, the Classic 200, 79 amps and the Classic 250, 63 amps, why would you need any other controller? MidNite Solar has doubled its factory floor space for production of the Classic line of charge controllers, making the Classic the only real “Made in America” charge controller. The Classic standard models are the only MPPT controllers with built-in Arc Fault Detection, making them the safest controllers available.